On January 30th 1989, founder Duncan Low signed the official registration of the Scottish International Children’s Festival. To celebrate their thirtieth birthday, I’m working with Imaginate to help document the company’s many adventures. 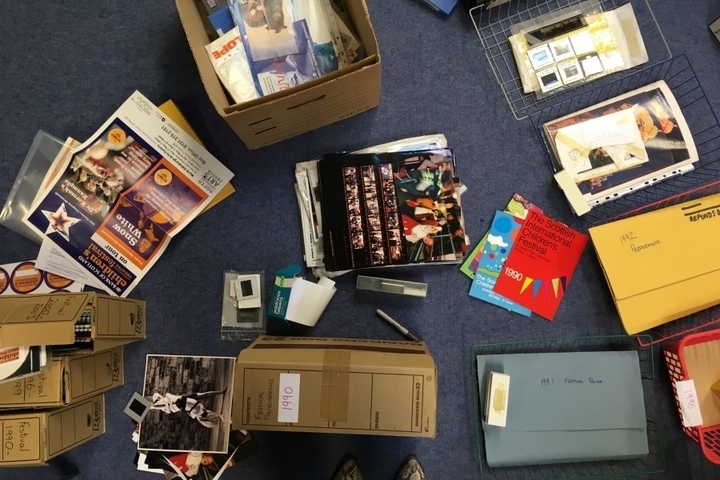 My brief: put together a research collection for the Scottish Theatre Archive at Glasgow University, and build an interactive online tool so that friends of Imaginate can explore thirty years of the festival in all its forms. Thanks to funding from the Scottish Graduate School for Arts and Humanities, I’ll be spending three months rummaging through boxes, dusting off photo albums and interviewing a few familiar faces. Step one was to take on… the cupboard. In the Grindlay Street office there’s two large shelves of folders containing all sorts of documents, some that date back to the first ever board meeting. I got busy emptying everything out onto the floor and trying to map how the festival has grown and changed. In short, making a massive mess. My first goal was to find a copy of every single festival programme, and it turned out to be much trickier than I expected. We’re still missing the programme from 1995, but I discovered that the National Library holds what seems to be the last surviving copy. They’ve promised to let us take photographs, but please get in touch if think you might have one in the attic! After that, I began digitising some of our oldest material (basically, spending many hours with the scanner), and trying to match a big box of scrambled photographs to each year of the festival. It’s slow work, and feels like patching together a 10,000-piece jigsaw, but it’s so satisfying to see the collection start to take shape. The next challenge is to find a special kind of scanner that can help me capture the tiny images on old projector slides, as there’s over one hundred of those from 1990 to 1994. Who knew scanners could be so complicated? Then, throughout February, I’ll start filming video interviews with people who shaped the festival’s history. I’ll use this blog to share my most exciting findings, starting with these artefacts from the first festival in 1990. 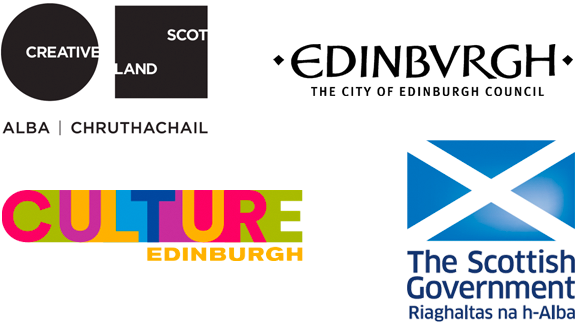 It took place in tents in Inverleith Park, from May 29th to June 3rd, and Princess Margaret attended a gala performance by the critically acclaimed Belgian company Theatre de la Guimbarde. Tickets for the main stage cost £2, and 20,476 children, parents and teachers got involved in a huge range of productions and activities: crafts, clowning, music, dance from Zimbabwe and Dundee, bold Scottish theatre and gritty drama from New York City.